On June 12, my adopted city was attacked. For the past week I have felt like I did when I went through Safety Town; scared, and threatened. But I have also never felt prouder of this city. I have watched this city pull together and stand with each other. Individuals have organized blood drives, fundraisers, support events, and so much more. Today, I attended the Candlelight Vigil at Lake Eola with a friend who is a member of the Orlando LGBTQ community. 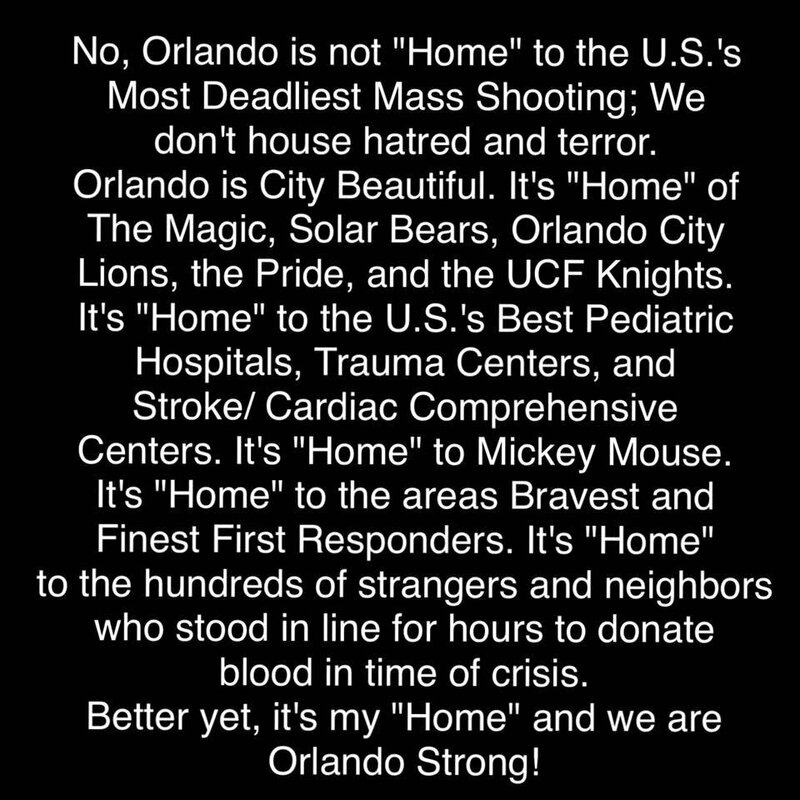 Seeing all the support for the victims and first responders was amazing. Everyone was there with one goal; to let the world know that we will never be knocked down, we will never waiver from being a city where everyone is welcome. I fell in love with Orlando because of the "vibe" of the city. The diversity and acceptance that can be found in here is what makes this city great. It is what encouraged me to make this city my home. 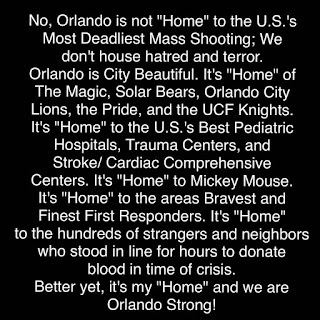 From what I saw tonight I know that Orlando will rise from the ashes of this disaster and be greater than ever. We will never forget what happened or the individuals who fell, but this city will recover and we will learn from this experience. No matter what you believe in or who you love, The City Beautiful will always welcome you with open arms. This banner was flown around Lake Eola before the Vigil. A small portion of the people at Dr. Phillips honoring the fallen. Florists were handing out these flowers to everyone. This was one of the many acts of kindness and community I witnessed at the Vigil. The organizers of this heart were inviting everyone to come and place a flower on the heart. They had pre-cut flowers available. Ribbons that were hanging on trees around Lake Eola. The flags are still at half mast. This image gives you an idea of the amount of people that were present. It was taken around 5:00PM. Well before the official beginning. This rainbow appeared over Lake Eola right before the Vigil officially began. The entire lake was one large group of people. I've never imagined this many people would show up. You can faintly see all the candles. Everyone was sharing lighters and matches to help keep the flames lit despite the wind. The fountain was light as a rainbow. I'm not sure if this is an everyday thing but tonight it felt special.